We are lucky enough to have a washer and dryer in our fifth wheel. 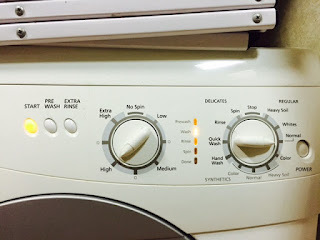 There has been a little learning curve using it - there aren't nearly the same number of options that I am used to when doing laundry at the house. 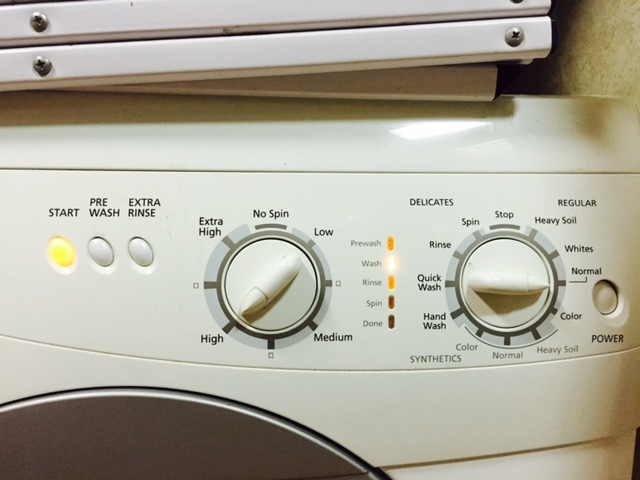 There are only a few options on my washer such as delicate, regular, and synthetics and a variety of spin speeds. My dryer has even fewer options. 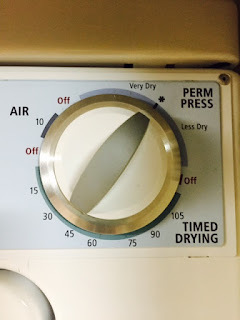 Timed dry or permanent press (no temperature control). For added fun, when we bought the Rv, no owner's manual for either one! I am what my friends consider a stainmaster in training (my Mom being the stainmaster). I cannot begin to count the number of times myself, my husband, or even my friends have gotten something on a piece of clothing that then needs to be diagnosed and then removed. 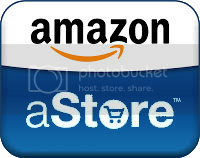 There is an art to getting usually unknown substances out of the clothes we spend our hard-earned money on. Mostly, I have found it to be a trial and error process. The biggest key - get to it asap - and never ever dry the clothing until you are sure the stain is completely removed. Drying it most times will permanently set the stain. Also, occasionally when I am at a store, grocery, Target, Walmart, pharmacy - I take a look at the laundry aisle to see what stain removers are there compared to what I have at home. Most times, a fels-naptha bar will do the trick. If not that, I have my secret stain weapon (my mom's recipe)! In a regular sized spray bottle mix an inch and a half of dish soap and an inch of ammonia and then fill the rest of the bottle with water. This mixture will last you quite a while and will get out so many things! Anyway, back to my Laundry fail. Despite living full time in the Rv for several months now, I still haven't managed to get used to having to check the level of the tanks (grey and black). For any of you who have been Rving for a while - you know just how important this is!! Typically I do a few loads of laundry a week. This is far less than I used to do at the house as I used to separate whites, lights, darks, jeans, brights, towels, and linens. Lots of loads! But, at the house, this was never a problem. I had a wonderful delay start feature so most times I would load the washer at night before bed and it would be done by the time I woke up. I was able to dry the load by the time I was ready for work! Now, I do darks and brights together, whites and lights together, and towels and linens together. Not the most ideal way, but I would otherwise be using quite a bit more water, electricity, and time that could be spent in other ways. This week, after two loads of laundry, I went upstairs (our bedroom, bathroom, and laundry closet are all the front of our fiver) to empty the dryer and start the next load I was very surprised when I stepped onto a soaking wet carpet! I couldn't believe it! I was sure that something horrible had gone wrong. Maybe a hose popped off the back - I had heard of that before... But, looking into it further - and following my nose, I discovered that I had overflowed our tanks! I had not know until now, that the washer empties into our bathroom grey tank, along with the shower and sink (thank goodness it wasn't the black tank!!!). The result of overflowing the tank, it overflowed into our shower and then onto the carpet covered floor in the bathroom. Ewww! Too bad this all happened at 10 o'clock at night - but, as I unfortunately had to say earlier this week... It could have been a lot worse! !